Preheat oven to 325 degrees. In a small bowl, mix the olive oil, garlic, rosemary, basil, Italian seasoning, and ground pepper. Set aside. Remove the innards from the turkey. Wash the turkey inside and out and pat dry. Remove any large fat deposits. Loosen the skin from the breast by slowly working your fingers between the breast and the skin. Work the skin loose to the end of the drumstick, being careful not to tear the skin. 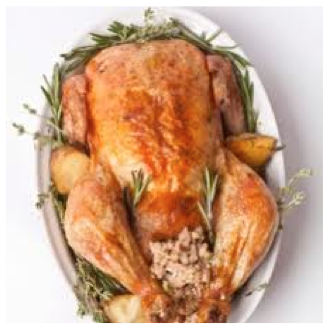 Using your hand, generously spread the rosemary mixture all over the breast of the turkey under the skin. Spread the remainder of the rosemary mixture on the outside of the breast. Use toothpicks to seal the skin over any exposed breast meat. Place the chopped white onion, minced garlic, and chopped celery in the cavity of the turkey. Place turkey on rack in roasting pan, add about a 1/4 inch of wine to the bottom of the pan (or do half water half wine, depending on preference-I find that wine makes the turkey very moist and tender). Roast turkey for 3 to 4 hours in preheated oven, or until turkey reads an internal temperature of 180 degrees. Once turkey is done, before you cut into the turkey, pull out the onion, garlic, and celery and throw away.